If you’re thinking about contracting through a limited company, please take a few minutes to read this short guide to find out a little more about what is required in the setting up and running of a limited company. To find out how much you could earn through a limited company, simply complete the quick quote form opposite for a 'no obligation' income illustration. A limited company is owned by its shareholders, who are allocated a percentage of shares in the business. The term “limited” refers to the fact that the company’s finances are separate from the personal finances of the owners. Shareholders have ‘limited liability’ which means they are liable only for the amount that they have invested in the company and are not personally responsible for company debts. However, they may be asked to give a director’s guarantee in order to obtain company finance from a bank or other lender, in which case they may be personally liable for that debt. The Company must be registered at Companies House. Annual Accounts and an Annual Return must be filed at Companies House each year. A return of the Companies Profits must be made to HMRC each year. Any resulting Corporation Tax must be paid to HMRC within nine months of the Company year end. PAYE must be operated for anyone employed by the Company, and the company must pay any income tax and national insurance due to HMRC each month. 2. How do I start contracting through a limited company? Most contractor accountants will form a limited company for you; however for those contractors who intend to set up their own Limited Company, the following basic guide outlines the requirements for registering your company. Before your business can set up as a limited company (or become “incorporated”) it needs to be registered with Companies House. Memorandum of Association – includes information on Company Name, Location and Type of Business. Form 12 – Simply states that the Company complies with the terms of the Companies Act. These documents are normally prepared by accountants or formation agents; however there is no legal requirement to use either. Guidance on all aspects of the registration process, including documentation required to complete the registration process can be found at the Companies House website. 3. How do I pay myself through a limited company? If you are contracting through a limited company, the way in which you pay yourself depends on the IR35 status of the individual contract you are working on. A good accountant who is knowledgeable of the contracting / freelancing market should be able to arrange an IR35 review of your contract. What if your contract is outside IR35…? If your contract is outside IR35 then most contractors choose to take the traditional tax efficient route of a low salary (subject to income tax and national insurance) combined with high dividends which are not subject to national insurance). Dividends are a distribution of the company’s ‘after-tax profits’ to the shareholders of a limited company. Any limited company which has generated profits can pay a dividend to its shareholders. Any dividend paid from a company that is not profitable will be deemed illegal. After tax profits = Total income / revenue – Expenses (includes your minimal salary) – Company Taxes. This strategy of taking a minimal salary each month ensures that the company generates after tax profits (as your income will be greater than your outgoings), at which point you can then pay yourself a dividend. It is necessary to complete a dividend declaration form each time a dividend is declared. What if your contract is inside IR35…? Unfortunately, if your contract is caught by IR35 then all income, less a 5% deduction to allow for expenses, will be subject to tax and national insurance. Download the Complete 'Guide to Contracting' for Free! PAYE is “pay as you earn” income tax that has to be deducted from your salary before it is paid to you. As part of your accountancy service your accountant will be able to register your company for PAYE and undertake all the necessary administration for you, such as keeping payroll records, advising you of your PAYE and national insurance liability each month, and submitting all year end forms to HMRC. 4. Claiming Expenses through your Limited Company? The expenses you are allowed to claim through your Limited Company are dependent on the IR35 status of your contract. Your gross salary – contractors typically keep this low, in order to maximise the dividends that can be distributed to yourself as a shareholder (thereby avoiding employees and employers national insurance contributions). Spouse’s salary (which must be actually paid to them and not be unrealistic, having regard to the duties performed). If your spouse is already employed and earning £40,000 or more, there is unlikely to be any tax saving in paying them. Telephone - business calls only. Books, magazines, subscriptions and courses – where related to business and your contract work. Bank charges and interest – on your company bank account. Pension scheme – where paid by the company to a HMRC approved scheme. Business insurances, business contents and other business related insurances. Business related stationery and postage costs. All of the above expenses should be supported by a valid receipt or document, with the exception of salary and car mileage. 5. Do I need to be registered for Value Added Tax (VAT)? Value added tax (VAT) is a tax on consumer expenditure. It is collected on business transactions, imports and acquisitions, and is administered by H.M. Revenue & Customs. If your company’s taxable supplies (the supply of any goods and services which are subject to VAT at any rate) are likely to exceed £70,000 in the next 12 months then you will need to register for VAT. Once your company is Vat registered you will need to charge VAT on your invoices at the standard rate of 20% (as of 4th January 2011). Until then you can simply raise sales invoices without adding VAT. 50% of the VAT paid on either the car lease rental payments or car contract hire payments. What are the disadvantages of VAT registration? The drawback to being VAT registered is that you are required to complete quarterly VAT returns and submit them to H.M. Customs & Excise. Most companies will employ an accountant to complete their VAT returns. VAT payable must be paid by the last day of the month following the VAT quarter. Failure to pay on time can result in penalties and is likely to increase the chances of your company being selected for a VAT inspection. IMPORTANT: In order to recover VAT on items that you buy for the business you need to obtain a “VAT invoice”, which shows the suppliers VAT number. Remember to always ask for a VAT invoice as these are not normally provided as standard. Corporation tax is tax on your company’s taxable income or profits. For small companies with annual profits not exceeding £300,000, the rate of corporation tax is 21% (this is called the small companies rate). Any companies with profits in excess of £300,000 will be liable at 28%, subject to marginal rate relief. Companies are required to work out their own corporation tax and are required to deliver a corporation tax return by the statutory filing date, normally 12 months after the end of the accounting period. Failure to do so can result in the company receiving a penalty. When contracting through a limited company ,most will need to record their time on a timesheet so that their agency or client can approve the hours / days they have worked in a certain billing period. In addition, you will need to ensure that an invoice is raised and submitted to your agency / client for your time. Many accountants now provide an online portal or timesheet system for their contractors where you can login and record your hours and expenses and also create and send invoices. As a contractor there are a few options available to you in running your limited company. Look after the administration and accounting requirements (specified in section 1) yourself. Most contractors choose to appoint an accountant, but this choice really depends on how much time (and accountancy knowledge) they have to look after the administration and accountancy side of their business. Should you decide to appoint an accountant, we would advise choosing one that has experience in the contracting / freelancing industry, as the complexities of contracting legislation like IR35 can bring serious pitfalls. Hopefully this brief guide has given you an insight into what is involved in contracting through a limited company. 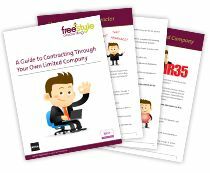 Freestyle Accounting is a firm of specialist contractor accountants providing a complete limited company accountancy service for freelancers and contractors. If you have any questions or require further advice on setting up your own limited company, please contact Freestyle Accounting on 0800 954 2101.